Dr. Anna-Lisa Paul, Research Associate Professor in the University of Florida’s Genetics Institute, has joined the Suborbital Applications Researchers Group. She is replacing Dr. Erika Wagner. Dr. Paul has an extensive background in molecular genetics with a specific interest in space research to study adaptive responses in extraterrestrial environments. Dr. Wagner recently left MIT, where she ran the X-Prize Lab, to become business development manager at Blue Origin. She will also be an affiliate instructor in the new X-Prize Lab at the University of Washington. SpaceX will continue to occupy its headquarters building in Hawthorne, California for at least the next 10 years, according to an article in the Daily Breeze. SpaceX reportedly made the commitment after a unanimous vote by the Hawthorne City Council to reduce the tax rates applied to the company. SpaceX has signed an economic-development agreement with the city which includes a corporate-citizenship clause. The clause allows Hawthorne to use the SpaceX logo for its own branding. It also encourages SpaceX to get involved with schools and community events. This doesn’t mean that all of SpaceX’s manufacturing facilities will necessarily be in Hawthorne. Sources close to SpaceX tell us the company is rapidly outgrowing its building there. Falcon Heavy, we are told, will likely require a new facility. 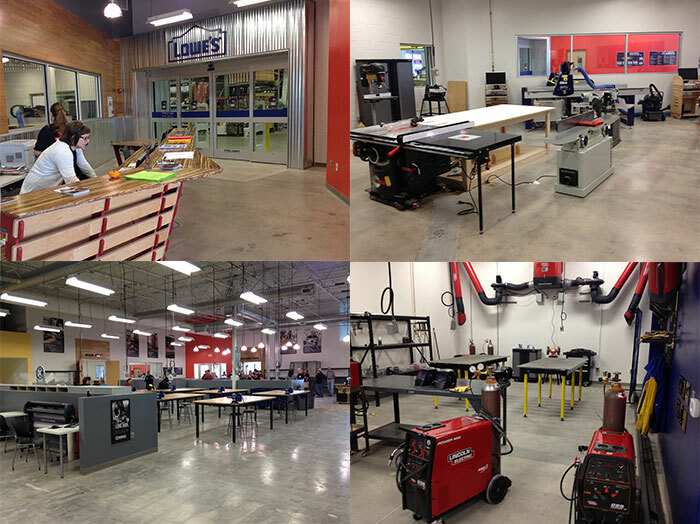 The MakerPlane Shop just opened today. For those who don’t know, the MakerPlane Project is an open-source aviation project to enable people to build safe, affordable light aircraft using CNC mills and 3D printers. The MakerPlane will also include state-of-the-art digital flight instruments and displays running open-source software. We probably won’t see MakerRocketships soon. Companies like Virgin Galactic and XCOR have worked for years to get where they are. It hasn’t been easy, even with a full-time staff and venture funding. Being first is always hard, though. Who knows what we might see in 10 or 20 years? 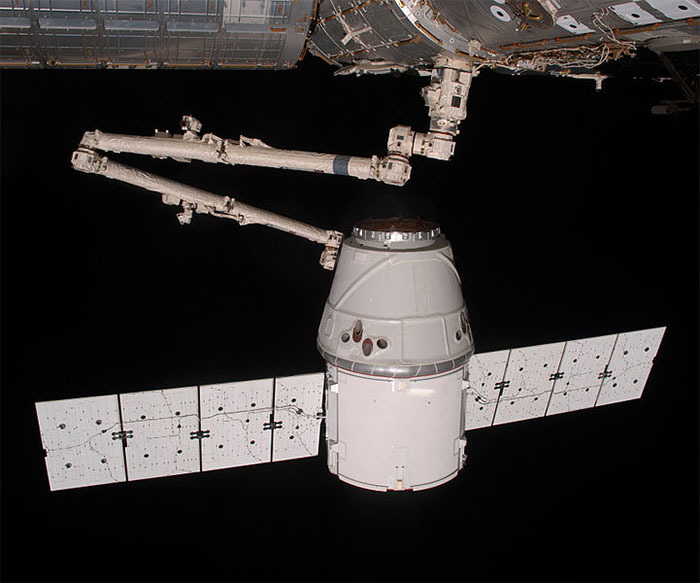 The SpaceX Dragon capsule has undocked from the International Space Station and returned to Earth. Reports from SpaceX indicate that the capsule has been retrieved by the recovery boat and is on its way back to port. Felix Baumgartner has raised some hackles with critical comments about NASA’s future aspirations for Mars and Sir Richard Branson’s suggestion that someone might try a higher skydive from SpaceShip Two. It appears that Baumgartner is already anxious about protecting his legacy. Baumgartner’s comments are reminiscent of complaints by Sir Edmund Hillary and other pioneering mountaineers about modern climbers paying their way to the summit of Mount Everest. A graduate student at the Massachusetts Institute of Technology Department of Aeronautics and Astronautics has devised a new method of deflecting Earth-approaching asteroids. Previous work has shown that an asteroid might be deflected by a swarm of smart pebbles. MIT’s Sung Wook Paek has expanded on that idea by replacing the pebbles with paintballs. Asteroids are normally dark in color. Painting an asteroid white would alter the albedo, or reflectivity, of the asteroid. That, in turn, would alter the tiny, but measurable, thrust which sunlight imparts on the asteroid. Over a long period of time, that change in thrust could produce a significant change in the asteroid’s trajectory. A warning time of approximately 20 years would be required for this method to work. Blue Origin is planning some major design changes for the next version of its New Shepard suborbital vehicle, according to MSNBC’s Alan Boyle. In addition, the size of engine pumps scales with the volume of propellant to be pumped, rather than the weight. Hydrogen-fueled engines generally have a lower thrust-to-weight ratio than kerosene engines. That could be offset, though, by lower thrust requirements since the hydrogen weighs less than an equivalent amount of kerosene. There might also be some weight savings from replacing five smaller engines with one larger engine. Also see Blue Origin Had a Great Day in West Texas. Six Italian scientists and a former government official have been sentenced to six-year prison terms for failing to predict an earthquake. The charge was practice. The scientists were effectively tried for scientific malpractice, although the prosecution did not use that term. The implications of this verdict for scientific research in Italy are alarming. Malpractice suits have had a devastating effect on the medical industry. We hope this sort of thing doesn’t spread to other countries. We’re all for holding government officials accountable for their failures, but this is ridiculous. No one can know the unknowable. Even meteorologists make mistakes, and weather forecasting is a much better developed field than earthquake prediction. This verdict could have implications for planetary defense. A major asteroid impact could have effects felt on planet-wide scale. A scientist who fails to predict an asteroid impact might conceivably be held accountable in any country, including Italy. Such fears might cause scientists to avoid the field or to “cry wolf” by always erring on the side of caution, leading to an ultimate loss of public trust. One prediction we’re willing to stand behind: there won’t be a lot of international seismology conferences held in Rome in the near future. The European Space Agency has selected a Swiss proposal for funding as the first in a new class of small, low-cost science missions. Cheops (CHaracterising ExOPlanets Satellite) is planned for launch in 2017. The 30-cm (11.8-inch) telescope is designed for high-precision monitoring of a star’s brightness to detect planetary transits. Accurate transit measurements will allow scientists to determine the radius of transiting planets. It will also identify exoplanets with significant atmospheres. During the 2008 Presidential campaign, an Obama education advisor named Steve Robinson got himself into hot water by suggesting that Americans, especially the younger generation, are no longer inspired by sending humans into space. According to Robinson, young people are more inspired by sending robots into space than sending humans. CNN journalist Miles O’Brien, who was moderating the debate where Robinson appeared, seemed to disagree with him. The Obama campaign did not stand by those statements, which were later disavowed, but we’ve heard the same argument repeated many times, by various people. Recently, Professor Lawrence Krauss of Arizona State University (probably not a member of the “younger generation”) wrote that he found sending robots more exciting. In our view, this debate is meaningless. Miles O’Brien asked the wrong question. It doesn’t matter whether people are excited and inspired by sending humans into space. Very few people are excited and inspired by the idea of sending humans to Paris, Hawaii, or China – but lots of people are excited about going to Paris, Hawaii, or China. People are not excited when a government employee, who they’ve never met, goes on a business trip to an exotic location. They are excited when they go on a trip to an exotic location. For 50 years, government space programs have been telling the public that space exploration is important, without ever giving the public the chance to explore space. That is about to change. When it does, there will be no lack of excitement and inspiration. A satellite tracker’s analysis of a meteor seen over the United Kingdom on September 21 suggests that it was an Aten asteroid, not space debris as originally believed. Aten asteroids orbit the Sun at an average distance less than 1 AU (in other words, inside Earth’s orbit). Because their orbits are highly eccentric, most Aten asteroids cross the Earth’s orbit when approaching aphelion. This makes Aten asteroids potentially hazardous objects. The asteroid 99942 Apophis is an Aten asteroid. Apophis, which was discovered in 2004, made news because it is large enough to be dangerous and was calculated to have a significant probability (2.7%) of hitting the Earth in 2029. Later estimates reduced that probability greatly but there is still sufficient uncertainty that some observers would like additional data.The Russian space agency Roscosmos recently announced plans for an unmanned mission to place a radio beacon on Apophis. Aten asteroids are not only dangerous to the Earth, they are also difficult to detect and observe. Because Atens spend most of their time inside the Earth’s orbit, their sky position, as seen from the Earth, is close to the Sun. The brightness of the daytime sky interferes with observations by ground-based telescopes. Spaceborne telescopes don’t have the bright sky to contend with, but they have insrument-safety considerations that limit their ability to observe objects close to the Sun. If a space telescope like Hubble was accidentally pointed at the Sun, it would burn out a camera that costs hundreds of millions of dollars (and can no longer be replaced, since the Shuttle is retired). So, operators impose strict limits on telescope pointing to prevent it from getting too near the Sun. 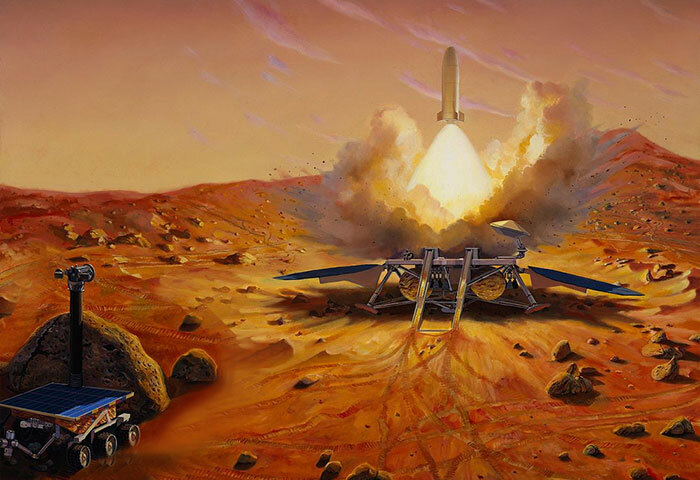 One solution to this problem is the Atsa Suborbital Observatory, being developed by astronomers at the Planetary Science Institute and The Citadel. The Atsa Suborbital Observatory is a fairly small telescope, based on a 14-inch Celestron reflector, which will fly aboard the XCOR Lynx Mark III. Because the Atsa telescope is easily serviceable, it can be pointed very close to the Sun with little danger. Accidentally burning out a $500 CCD chip that can replaced the next day is not a catastrophe like damaging the Hubble. In other news, a meteor the size of a car landed in the Martinez Hills in the San Francisco Bay Area. There are no reports of casualties or damage, but this is another reminder of the fact that our Earth is constantly being hit by objects from space. Sooner or later, we will be hit by something much larger and more dangerous. We recently compared NASA’s $8 billion James Webb Space Telescope to the European Extremely Large Telescope, which will provide 6 times the resolution at 1/6 the price. To be fair, NASA is studying some ideas for in-space servicing of JWST, using the Orion capsule and Space Launch System. Impartial observers do not consider those ideas to be credible, however. An Orion mission to the Earth-Sun L-2 point, where JWST is to be located, would cost a minimum of $2 billion, for the launch alone. That assumes Orion and SLS are already developed and available when they are needed. Beyond the matter of cost, there are all sorts of technical obstacles. The JWST is not designed for in-space servicing. The Orion capsule is not designed to provide a stable work platform for servicing missions. The L-2 point is located 1.5 million miles from Earth. At that distance, the round-trip time lag for communications is 16 seconds, limiting the ability of mission control to provide ground support during EVAs. The United States needs to develop its ability to do in-space servicing in Low Earth Orbit and, eventually, in deep space. That ability needs to be developed in a sensible manner, however. Astronauts have been doing in-space maintenance and repairs since Skylab. 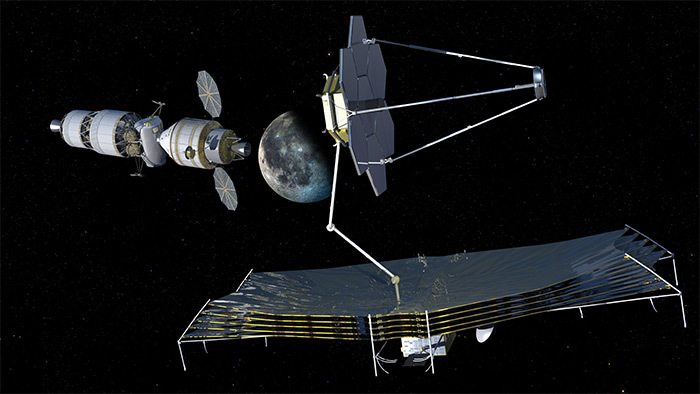 The challenge now is to make in-space servicing cost-effective. Some will say robots are the answer, but robots are not a magic bullet. The 16-second time lag for communications at L-2 is an impediment for humans but a killer for robots. We need to develop a range of servicing methods, both human and robotic, but we also need to develop the supporting infrastructure including low-cost transportation to orbit, low-cost transportation in orbit, and appropriate, cost-effective on-orbit facilities. Most of this infrastructure will be developed commercially in the decades to come. For now, it appears that NASA is trying to tie two expensive programs – JWST and Orion/SLS – together. That’s a strategy NASA has employed successfully in the past, with programs like the Space Shuttle and Space Station. It’s a dangerous strategy, however, which makes it harder for Congress to cancel one program but drives up overall costs. If Congress ever becomes serious about saving money, both programs will be in danger. European astronomers have discovered a planet with about the mass of the Earth orbiting the second star in the Alpha Centauri system. It is the smallest exoplanet yet discovered around a star like the Sun. The planet was discovered using the 3.6-meter telescope at the European Southern Observatory’s La Silla Observatory in Chile. Congratulations go out to Felix Baumgartner (and the Red Bull Stratos team) for his record-setting high-altitude jump. Baumgartner’s successful jump will help prepare the way for suborbital citizen space exploration. The Stratos team is not only testing out spacesuit technology, which will be extremely important for suborbital flights; it is also helping to set public expectations regarding risk, safety, and regulation of citizen space exploration. This regulatory model is very close to the “informed consent” model for spaceflight participants created by the FAA Office of Commercial Space Transportation. Given the inherent risks and training requirements, spaceflight is more akin to skydiving than commercial airline travel. It will remain so for the foreseeable future. The informed consent model, therefore, is a good one. Unfortunately, it’s a model that many in the public and the space enthusiast community do not currently understand. Skydiving is an example we can point to in order to better inform the public. The space community should also take note of the FAA’s admonition to the skydiving community. The freedom to fly does not come with out a price. We must self-regulate to ensure that best practices are followed for every aspect of operations, including equipment, maintenance, and training. If we fail to do so, we invite increased government regulation that may have negative consequences for the future of the industry. The citizen-science project planethunters.org has reported the discovery of a new circumbinary exoplanet, designated Planet Hunters 1 (PH1). The 1967 Outer Space Treaty explicitly states that space, including the Moon and other celestial bodies is “not subject to national appropriation by claim of sovereignty, by means of use or occupation, or any other means.” Today, some lawyers argue that clause (known as ”Article II”) prohibits private property as well. Yet, that is not the way the Treaty was interpreted at the time.